Using NASA's Kepler Space Telescope, astronomers have discovered the first Earth-size planet orbiting a star in the "habitable zone"—the range of distance from a star where liquid water might pool on the surface of an orbiting planet. The discovery of Kepler-186f confirms that planets the size of Earth exist in the habitable zone of stars other than our sun. "We know of just one planet where life exists—Earth. When we search for life outside our solar system we focus on finding planets with characteristics that mimic that of Earth," said Elisa Quintana, research scientist at the SETI Institute at NASA's Ames Research Center in Moffett Field, California, and lead author of the paper published today in the journal Science. 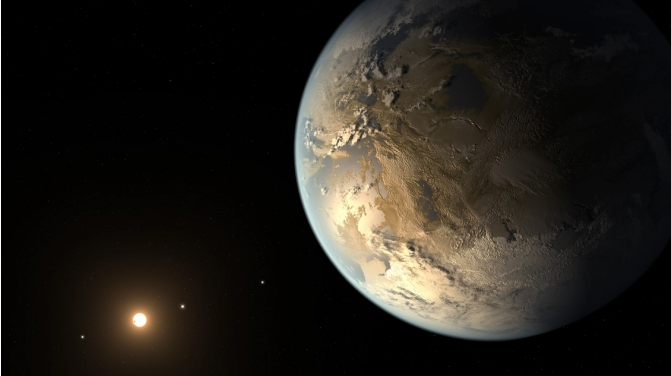 "Finding a habitable zone planet comparable to Earth in size is a major step forward." The next steps in the search for distant life include looking for true Earth-twins—Earth-size planets orbiting within the habitable zone of a sun-like star—and measuring the their chemical compositions. The Kepler Space Telescope, which simultaneously and continuously measured the brightness of more than 150,000 stars, is NASA's first mission capable of detecting Earth-size planets around stars like our sun. Ames is responsible for Kepler's ground system development, mission operations, and science data analysis. NASA's Jet Propulsion Laboratory in Pasadena, California, managed Kepler mission development. Ball Aerospace & Technologies Corp. in Boulder, Colorado, developed the Kepler flight system and supports mission operations with the Laboratory for Atmospheric and Space Physics at the University of Colorado in Boulder. The Space Telescope Science Institute in Baltimore archives, hosts and distributes Kepler science data. Kepler is NASA's 10th Discovery Mission and was funded by the agency's Science Mission Directorate.